Wanted t o blog about this last week but ran out of time and couldn’t find the connecting cable for the camera/pc in the ongoing chaos that is our house redecoration. 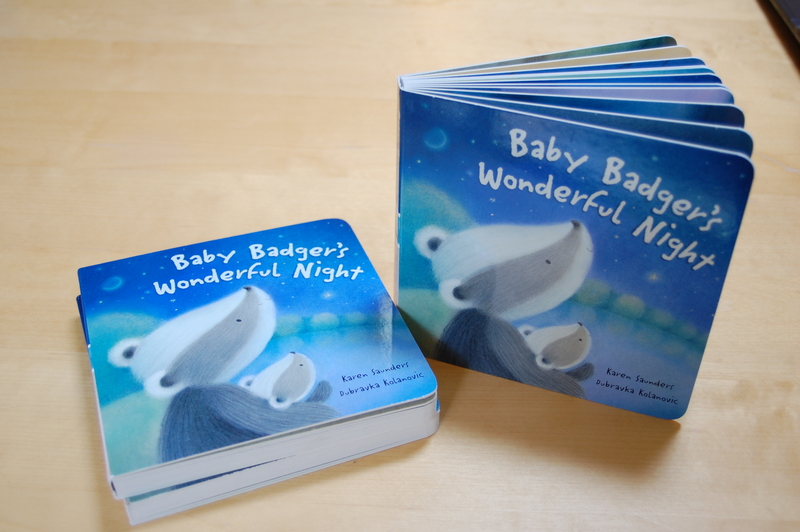 There was much excitement in our household on Monday when the first copies of Baby Badger’s Wonderful Night in board book format arrived in the post. It looks GORGEOUS (even if I do say so myself). Plus it’s a bargain, at only £3.99. If you did, perhaps, want to buy a copy *bashful*, it’s available on Amazon already here, although the official pub date isn’t until the end of July, otherwise it would be even better if you fancied buying/ordering it from your local independent bookshop or branch of Waterstones. Thanks to the lovely folk at Gullane, who publish it.